Great movie, I did think of all the transhumanists in the scenes where the 'Watchmen' were all gathering in superhero costumes for the group photo. Recall a scene near the end after the big show-down between Dr Manhattan and Ozymandias, Manhatten had Ozymandias at his mercy. (Although admittedly, Ozymandias then pulled a great metaphorical escape fitting of a super-high IQer). Ozymandias's motives seemed pretty illogical, if he was that smart he should have thought of a much better way than that to save the world, but the ending did make for a great story and was, as you say, in keeping with the overall cynical tone of it all. But beings with super powers are notoriously aloof and amoral in fiction. In a sense they're 'too powerful', so I guess the authors have to invent ways to keep them side-lined from the main story track or they would dominate the plot. 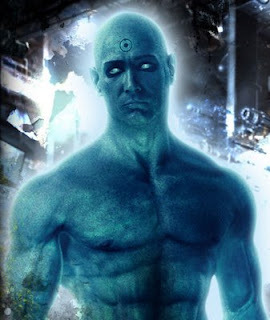 Some really spectacular surreal scenes with Dr Manhattan though, definitely weird enough to hint at posthuman existence. One thing that held my attention throughout the film was how everything was so one-sided. There were tiers of superherodom: Rorschach, Night Owl, Comedian and Spectre far outclassed the punks in the alleyway, or anywhere else; Ozymandias outclassed all of them, and Manhattan outclassed everyone. Unlike every other superhero movie, where the premise is that battles have more or less equal opponents and there's something at stake in winning or losing, here there's no question about winning or losing: the ones with the better qualities always win. The four were the best-trained warriors in the world; Ozymandias not only had the training, but a natural (but, we're supposed to believe, still within human capability) speed advantage and all that wealth to buy more capability and training; and Dr. Manhattan was, well, godlike. From a Transhumanist perspective, I take a very depressing message out of the film: when you're outclassed, you will lose. Your only hope is that you don't come to the attention of those in the tier above you. It is exciting to see posthuman themes popping up more frequently in mainstream media, and it is my hope that exposure to these themes will encourage people to explore the topic further. 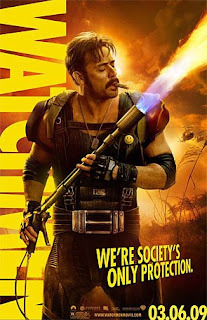 On the other hand, it always saddens me to see a movie put forth as a solid argument against technological development. How many times has Terminator been presented as an argument against AI, as if it is an inevitable scenario? For a (sometimes) less cynical exploration of possible human/posthuman scenarios in pop culture, I recommend Heroes and the new Battlestar Galactica series. I think it's extremely unfortunate that Alan Moore's name doesn't appear once in this entire article. All those elements you're referring to in the movie occur in the graphic novel and are creations of Alan Moore.